This week we review the hottest months of the hottest year on record, and the consequences for water availability. And forecasts…. Dear reader, we are in our second month of an annual fund drive. We will need $750 to pay for the next 12 months’ expenses. We’ve raised $111 of that! Your help would be much appreciated. If you use Paypal, you can send funds to editor@thebanner.news from your account there. Otherwise write to editor@thebanner.news and we will send you our street address. If we receive excess funds we will turn down any gifts in excess of our target of $750. And please feel free to ask for an accounting of the campaign. Cooperstown, NY— Otsego 2000, a nonprofit environmental and historic preservation nonprofit organization located in Cooperstown, NY, yesterday filed a Petition for Review in the U.S. Court of Appeals, D.C. Circuit, challenging the decision of the Federal Energy Regulatory Commission (FERC) to deny its Request for Rehearing for the pipeline and compressor station expansion in the Dominion New Market Project (FERC Docket # CP14-497). In that decision, FERC announced that it would not comply with existing legal precedent which required consideration of upstream and downstream greenhouse gas (GHG) emissions when reviewing pipeline projects. In so doing, FERC violated the National Environmental Policy Act (NEPA), and deprived pipeline opponents across the country of due process. It also triggered a rare 3/2 split decision with strong dissents filed by Commissioners LaFleur and Glick. Significantly, in June 2016, the Sierra Club sued FERC for failing to consider the upstream and downstream GHG impacts of the Southeast Market Pipelines Project (aka Sabal Trail). In Sabal Trail, the D.C. Circuit Court held that FERC must undertake an assessment of greenhouse gas impacts in pipeline approvals. The New York Department of Environmental Conservation (DEC) cited the Sabal Trail holding in denying a water quality certificate for the Valley Lateral Pipeline, built to supply gas to the CPV power plant in Orange County, NY. Instead of responding to DEC’s position on GHG emissions, FERC announced it would address the GHG issue in a future order. That order appears to have been issued by FERC in the Dominion case. Sidestepping a formal policy review process, FERC announced that it will ignore the Sabal Trail decision and ignore consideration of upstream and downstream greenhouse gas impacts for all pipeline approvals going forward. By announcing this action in the Dominion case, FERC attempts to bar litigants challenging pipeline projects in other cases from contesting its decision. Six individuals arrested for organizing a halt to construction of Spectra/Enbridge AIM fracked gas pipeline stand trial on the heels of Cuomo administration report confirming the high-pressure fracked gas pipeline running within 105 feet from decaying Indian Point Nuclear Plant puts 20 million people at risk, including NYC. Who : World-renowned scientists and nuclear experts, local community members who have been battling this pipeline for five years. This pipeline runs 105 feet from critical safety infrastructure at Indian Point Nuclear Power Plant on the Hudson River just north of NYC. Gov. Cuomo’s Administration just released the long-demanded Independent Risk Assessment (IRA) of this pipeline due to pressure before the election. His administration was lackadaisical in its response to residents’ pleas to deny approval of this pipeline. The district attorney has tried everything to get us to accept a deal so this doesn’t go to a trial. She has now lowered our charges to prevent a jury trial. The difference now is we have bench trial before the judge like we did for the Montrose9 case. This maneuvering by the District Attorney strongly suggests that she does not feel comfortable arguing on behalf of Spectra Energy in front of a jury of Westchester County residents. In view of this, it is even MORE important that you show up as many days of this as you can if you are in the Metro area or Hudson Valley of NY. Wear RED to note a physical signal that you’re with us for the judge to see the community support. Oil and gas companies could be off the hook for climate change-related damages if a new carbon tax proposal makes its way through Congress. The proposal is being spearheaded by Americans for Carbon Dividends, an industry-backed organization whose mission is to build support for the Baker-Shultz Carbon Dividends Plan, which proposes taxing carbon emitters and returning the proceeds to the American public. It also includes a waiver of the right to sue fossil fuel companies for climate change impacts and suggests rolling back most Environmental Protection Agency regulations on greenhouse gases. Launched earlier this month, Americans For Climate Dividends is co-chaired by former Senators Trent Lott (R-Miss.) and John Breaux (D-La. ), whose lobbying firm was hired to promote the campaign. Its public relations effort is being led by Hill+Knowlton, a firm that once spearheaded the communications campaign for Big Tobacco. A much-delayed state air monitoring study meant to gauge the long-term health risks of living near Marcellus Shale operations found limited impacts to the air quality around the sites it examined and little risk of healthy residents getting sick from breathing the air nearby. <p”>The study by the Pennsylvania Department of Environmental Protection was based on continuous and weekly sampling over more than a year at four sites surrounded by natural gas wells, compressor stations and processing facilities in Washington County in 2012 and 2013. It found generally better air quality there than at more urban comparison sites in Washington County and similar levels of hazardous air pollutants at a background sampling site at a rural fruit orchard in Adams County, well outside of the Marcellus Shale drilling region. But problems with the study, from data gaps and malfunctioning equipment to poor placement of monitors, made it less representative than its designers had hoped and less certain for drawing conclusions about the long-term heath implications of living near the Washington County sites or Marcellus Shale facilities elsewhere in the state. ATCHAFALAYA NATIONAL HERITAGE AREA, LA: Water protectors living high in the canopy of old growth cypress trees brought construction on the Bayou Bridge pipeline to a halt earlier today in the Atchafalaya Basin, the largest swamp in North America. The action – known as a tree sit– was initiated to amplify pleas from Louisiana residents who have begged their local elected officials to protect these ancient trees from destruction by the pipeline company and to provide an evacuation route for the predominantly African American St. James community, which sits at the tail end of the 163-mile Energy Transfer Partners project. Water protectors say they had hoped to avoid taking this drastic action, but say they have been forced to act because despite utilizing all other options, Louisiana residents remain unheard and unprotected. In early 2017, hundreds of Louisiana residents attended public meetings and thousands more submitted comments in opposition of the project, which if completed will cross over 700 waterways and run through the Atchafalaya Basin, exacerbating flooding in the region and harming crawfish habitat. Despite strong community opposition, the project was granted construction permits by the Louisiana Department of Environmental Quality and the Army Corp of Engineers. The Louisiana Department of Natural Resources granted the company a permit to build in the state’s environmentally sensitive coastal zone. In response, several local organizations filed suit to stop construction, contending that the Army Corp violated the Clean Water Act and other federal requirements when it failed to consider potential threats to the environment when issuing its permit. At the same time, other organizations – including a group of St. James residents – filed a separate suit, alleging that the Louisiana Department of Natural Resources did not follow state guidelines when issuing the permit without considering the impact the project would have on local environmental justice communities. Attracted by lax regulations, industrial agriculture has descended on a remote valley, depleting its aquifer — leaving many residents with no water at all. Early one morning in July 2014, Lori Paup awoke in her new home in the Sulphur Springs Valley of Arizona and began unpacking boxes of clothes, hanging photographs and prepping the day’s home-schooling lessons for her two teenage children. Paup, who until a few days earlier had never been to Arizona, was exhilarated to have finally arrived at the house on East Hopi Drive — a blue two-bedroom trailer on two acres of land — but also exhausted. The move from Fallentimber, Pa., where the family lived for 15 years, required a cross-country trip in the semi-truck that Lori’s husband, Craig, drove for work, and now a long list of chores awaited. Outside, the day was already north of 80 degrees. Lori was just beginning to fill a glass of water when she noticed the stream from the faucet was cloudy and brown. “The water looked like the desert surrounding the house,” she said. “The same color.” Running her hand under the stream, she found what appeared to be small grains of sand. A small woman with a tight smile and a bright orange streak in her hair, Lori was immediately unnerved by the sight. Like all homes in the valley, where there are no reservoirs or rivers, the Paups’ house drew its water from a private well drilled into the underlying aquifer. According to the real estate listing, the well reached a depth of more than 300 feet. Lori, who is 51 and a mother of five, reminded herself of this when, a few moments later, the sand appeared to clear and the water again looked normal. Busy with other projects, she scribbled a note to call the previous owners, figuring there was dirt clogged in the kitchen pipes. Soon enough, she forgot about it. A few days later, Lori and her daughter Amy were doing laundry when the washing machine stopped filling with water. Then, a few hours later, the dishwasher conked out, too. Craig, who had serviced his own diesel truck for some 20 years, inspected both machines but couldn’t find anything wrong with either. It was the pipes feeding them that seemed to be the issue; they merely trickled, then sputtered out sand. Having lived in the rural mountains of Pennsylvania, Craig and Lori were both familiar with wells; they picked the house on East Hopi for its sweeping views eastward to the Chiricahua Mountains but also for the solitude that came with owning a remote piece of property, which was only possible so long as they had their own source of water. But as worrisome as the incidents seemed, they didn’t yet form any recognizable pattern. One evening sometime later, Lori drew a bath and left the room. When she returned a while later, she found the tub stood only half full, the water murky with silt. She watched, over the next few moments, as a thin layer of sand settled along the bottom. …Over the next few weeks, as the Paups asked around, they heard from one neighbor, then a half-dozen more, who had begun finding sand in their water. Soon, at least 100 families from all across the valley had failing or dry wells. On Sept. 24, after scores of angry families demanded action, a regularly scheduled visit from state representatives turned into a de facto emergency water meeting at the Chamber of Commerce. Word of the dry wells had traveled quickly around the state, and Michael J. Lacey, who was then the director of the Arizona Department of Water Resources (A.D.W.R. ), made the three-hour drive from Phoenix for the standing-room-only meeting. The politicians had hardly begun to speak when men and women in cowboy hats grew impatient and cut them off, shouting, “Water!” For the next two hours, Lacey tried to retain control as panicked families rose one after another and told their stories. The Paups didn’t attend the meeting, but they needed only to drive a few miles in any direction to see where their water was going. 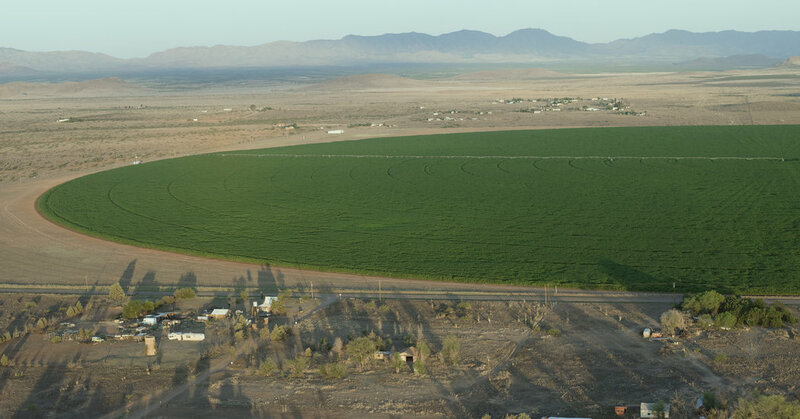 Stretching outward from downtown Willcox, the hub of the valley, lay a sprawling latticework of recently cultivated farms and nut orchards. Local farmers had watched over the last decade and a half as waves of industrial farms arrived, tilling so much land that dust storms began darkening the sky. These enormous corporations were descending on the valley for the same reason homesteaders had a century ago: the year-round growing season and the lax regulation. Compared with those for rivers and lakes, few laws govern the extraction of groundwater today. Aquifers across the globe are beginning to quietly dry up under the compounded strain of increased food production and a two-decade stretch that now includes the 10 warmest years in recorded history, sending farmers plumbing deeper for deposits of water. The oil and gas industry has created an elaborate and successful public relations campaign designed to convince Americans that burning natural gas – a fossil fuel – is the key to our energy future. Nothing could be further from the truth. America’s Pledge, an initiative co-founded by California Gov. 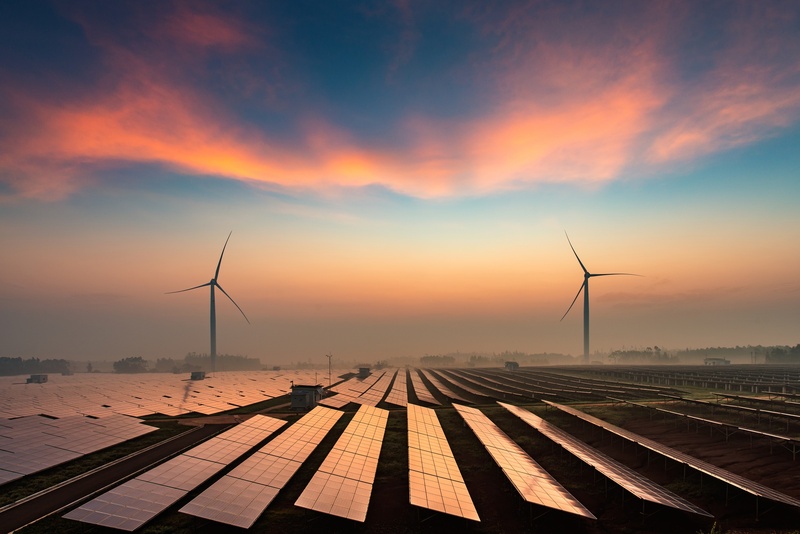 Jerry Brown and former New York City Mayor Michael Bloomberg, has released a report detailing “bottom-up” strategies for states, cities and businesses to take meaningful action on climate change. It’s a preview of a larger analysis of the effects of each strategy, set to be released in September at the Global Climate Action Summit. The report notes cities exercise “greater control over such economic factors as the sources and prices of electricity, modes of transportation, and climate resilience,” making them key players in climate goals. The America’s Pledge initiative was founded in the aftermath of President Trump’s decision to pull the U.S. out of the Paris climate accord — a decision that made cities among the key players in climate change efforts. The ‘We Are Still In” coalition of local and state leaders has been pushing cities to make stronger climate change reduction goals, with some 200 mayors pledging to keep up the country’s goal to cut emissions 26% below 2005 levels by 2025. An intense heat wave is fueling wildfires across an enormous swath of northern Europe, with at least 11 fires raging within the Arctic Circle, reported The Guardian. Sweden is the worst-hit country, with at least 40 fires burning as of Wednesday, Time reported. Multiple communities have been evacuated, and thousands of people have been directed to stay indoors with their vents and windows closed to avoid harmful smoke inhalation. European officials have stated that the risk of more fires continues as long as temperatures stay above 86 degrees Fahrenheit (30 degrees Celsius) — and that such warm weather is in the forecast for the coming days. Several Arctic-area locations have experienced record-high temperatures this year. Helsinki hit 86 degrees F (30 degrees C) for the first time in eight years, and the northernmost city in Finland, Utsjoki, experienced an all-time record high this summer of 92 degrees F (33.3 degrees C), The Weather Channel reported. Climate scientists have said that the Arctic and other areas that once experienced very little fire activity are becoming more vulnerable to wildfires, The Guardian reported. Declaring that climate change is “an issue of survival ” that must be confronted with urgency, young activists across the globe on Saturday kicked off three days of marches and demonstrations to pressure elected officials to “reject the corrupting monetary influence of fossil fuel executives,” ban all new dirty energy developments, and safeguard the planet for both its current inhabitants and future generations. “This Is Zero Hour,” the slogan and label of the worldwide marches, is aimed at clearly articulating the necessity of immediate and bold climate action as warming global temperatures continue to spark extreme weather events and wreak havoc, disproportionately inflicting irreversible harm on the poorest nations and most vulnerable communities. “Ban all new fossil fuel infrastructure and make massive investment in local solar and wind energy companies” in the coming years. “Kids are suing the government, we’re marching, we’re lobbying, we’re just pretty much just getting down and just begging them: Can I not have a world that’s totally falling apart?” Jamie Margolin, a 16-year-old environmentalist, told the Huffington Post . “It’s Zero Hour to Act on Climate Change.” Teen Activists Call for Action in Global Marches. KIEV, Jun 21 2018 (IPS) – A campaign to raise awareness of water security in Ukraine could be an inspiration around the world, activists behind it say, after it forced a change in the country’s approach to its water resources. After almost five years of promoting a vision of water security and proactive water management among various stakeholders and the government in Kiev, the issue of water security is now a top development priority for the government. Anna Tsvietkova of local NGO MAMA-86, a partner of the Global Water Partnership (GWP) intergovernmental organisation, and which was involved in the campaign, told IPS this was an example of how expert knowledge combined with awareness-raising could move water, or potentially other topics, to near the top of a country’s development agenda. “Our work could be an inspiration for groups in other countries. We were active and we gave the best advice. Our government had to accept our proposals [on water security],” she said. Large areas of heat pressure or heat domes scattered around the hemisphere led to the sweltering temperatures. The Canadian Broadcasting Corporation reports the heat is to blame for at least 33 deaths in southern Quebec, mostly in and near Montreal, which endured record high temperatures. Last November, China and West Virginia signed an $83.7 billion dollar, 20-year agreement to build a massive petrochemical hub in the state but that deal may be on hiatus in the midst of a de facto trade war spurred by President Donald Trump and a corruption investigation unfolding in the Mountain State. The deal would be worth more than the total gross domestic product of West Virginia, which was $76.8 billion in 2017. China’s sizable investment would create a sprawling petrochemical center in West Virginia, focused on storing and refining natural gas obtained via hydraulic fracturing (“fracking”) in the Marcellus Shale. Full details are sealed in a yet-to-be-released Memorandum of Understanding (MOU), which was inked during a trade mission attended by Trump and Chinese President Xi Jinping last fall in Beijing, China. While the Chinese side has cited the billions in trade tariffs imposed by Trump as the impetus for at least temporarily stepping away from the deal, in West Virginia an ongoing state- and federal-level official corruption investigation involving individuals who were part of the MOU signing has also slowed progress. Some of those individuals were named in a February investigation DeSmog published on the petrochemical hub. Using hydraulic fracturing to extract oil and natural gas from shale is a common technique used worldwide. Because the technique requires large amounts of water, however, it raises the question of whether it could lead to water shortages or competition with other water uses, especially agriculture. A worst-case scenario spill from the Enbridge Energy Line 5 pipeline through the Straits of Mackinac would affect more than 400 miles of shoreline in Michigan, Wisconsin and Canada, according to a state-ordered risk analysis. Such a spill would release 32,000 to 58,000 barrels of crude oil into the Great Lakes and put 47 wildlife species and 60,000 acres of habitat at risk, according to Michigan Technological University researchers. Clean-up, liability and restoration costs related to such a spill would add up to nearly $1.9 billion, according to the analysis of 4,300 spill simulations by Guy Meadows, director of Michigan Tech’s Great Lakes Research Center, and 41 experts. Why do I keep hearing about the California drought, if it’s the Colorado River that we’re “killing”? Pretty much every state west of the Rockies has been facing a water shortage of one kind or another in recent years. 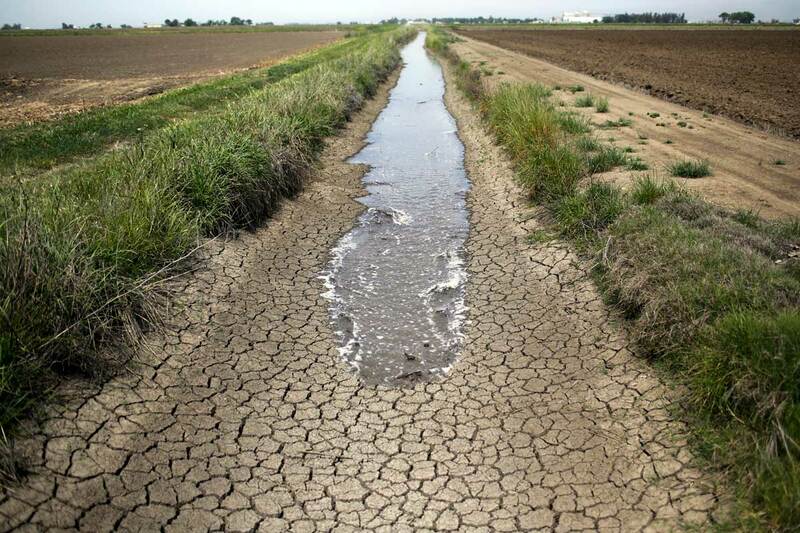 California’s is a severe, but relatively short-term, drought. But the Colorado River basin — which provides critical water supplies for seven states including California — is the victim of a slower-burning catastrophe entering its 16th year. Wyoming, Colorado, New Mexico, Utah, Nevada, Arizona and California all share water from the Colorado River, a hugely important water resource that sustains 40 million people in those states, supports 15 percent of the nation’s food supply, and fills two of largest water reserves in the country. The severe shortages of rain and snowfall have hurt California’s $46 billion agricultural industry and helped raise national awareness of the longer-term shortages that are affecting the entire Colorado River basin. But while the two problems have commonalities and have some effect on one another, they’re not exactly the same thing. Just how bad is the drought in California right now? Most of California is experiencing “extreme to exceptional drought,” and the crisis has now entered its fourth year. This month, signaling how serious the current situation is, state officials announced the first cutback to farmers’ water rights since 1977, and ordered cities and towns to cut water use by as much as 36 percent. Those who don’t comply with the cuts will face fines, but some farmers are already ignoring the new rules, or challenging them in court. …As a renegade politician turned President-Elect, López Obrador has many promises to keep. Communities impacted by oil and gas pipeline expansions, a result of the energy reforms, wonder which López Obrador will prevail: the one who called for a reversal of energy privatization reforms, or an appeaser who seeks to build trust with the business elite. Many signs, to date, point to the latter. And yet, in the months and years preceding the election, a pipeline opposition movement has arisen in Mexico, communicating its intentions to stand in the way of pipeline development, even in light of the election of López Obrador. That movement is led by indigenous peoples. Outgoing president Enrique Peña Nieto signed the energy reforms in late 2013, opening the previously state-owned oil and gas sector monopolized by the company Pemex (Petróleos Mexicanos) to direct foreign investment. The privatization effort was pushed by the U.S. Department of State, as first reported by DeSmog, under then-Secretary of State Hillary Clinton. With little popular fanfare, the floodgates are now open for international business, and since 2013, foreign companies have invested heavily in pipeline infrastructure set to transport oil and natural gas predominantly obtained via hydraulic fracturing (“fracking”) in the U.S. across the border into Mexico. And That’s A Wrap! Thanks to everyone who sent in news, action announcements and comments this week. Send kudos, rotten tomatoes and your story ideas, your group’s action events, and news of interest to intrepid climate change and environmental justice warriors! Send to editor@thebanner.news.